The SciVal Kepler release is now live! For our first release of 2018, we’ve added some much anticipated updates. 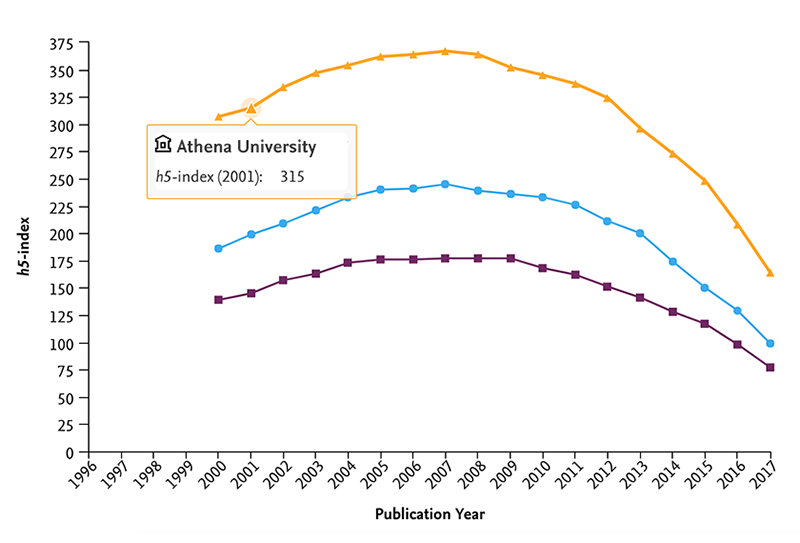 Topic Prominence is now available for Researchers and Groups of Researchers, we’ve introduced the h5-index and Books and Book Chapters are now available within the Benchmarking module. Fig 1. 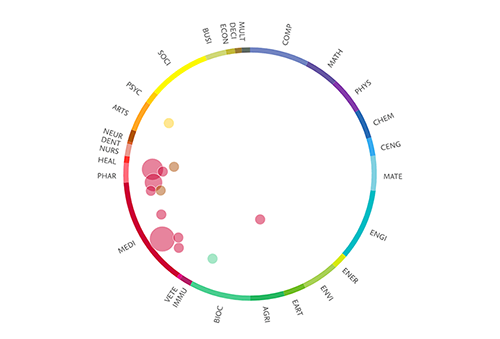 Wheel of Science shows the Topics, which John Smith is most active in. In this case they main pertain to medicine. The h5-index will be added to the existing basket of metrics, and is the h-index based upon data from the last 5 years e.g. when selecting 2016, the h5-index will be for 2012-2016. It is an established index which will be available for Institutions and Researchers, and can be filtered by subject areas. 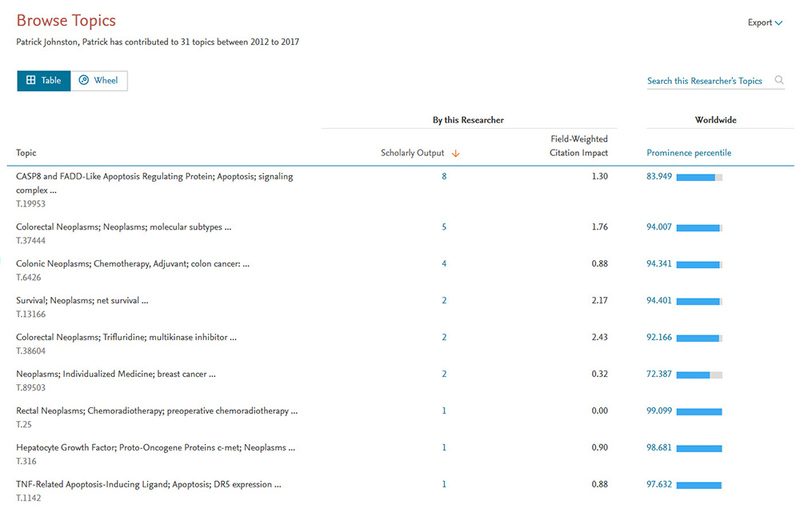 Following on from last month’s release, where the ASJC subject classification filters were introduced for Topic Prominence in Science, and based upon feedback, we have now enhanced the filtering by introducing a threshold, which is based upon the relative article share. It reduces the number of Topics attributed to an institution e.g. when an institution has relatively few papers attributed to a particular Topic. Currently the ASJC cut off is based on relative share of articles. The cut off threshold is 40%. It reduces the number of Topics attributed to an institution e.g. when an institution has relatively few papers attributed to a particular Topic. E.g., If Topic A has ASJC articles as follows, only the highlighted ASJCs (2701, 2703, 1703, and 1503) would be retained. 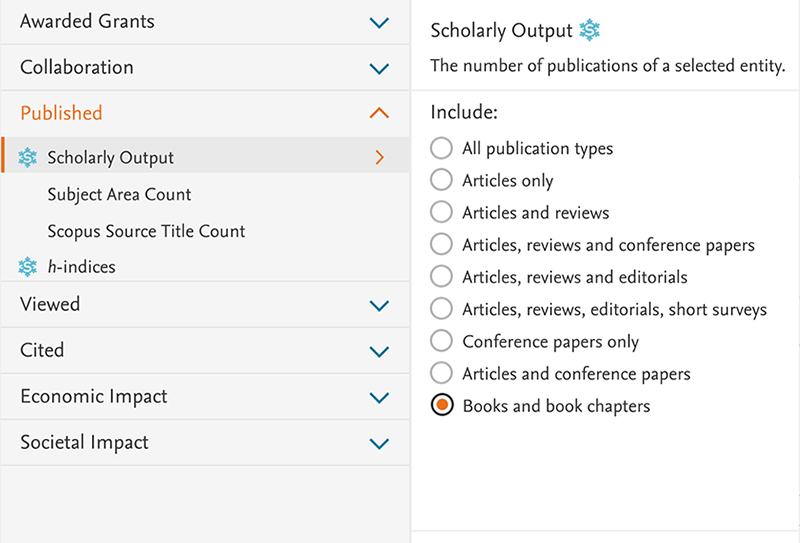 You are now able to select Books and Book Chapters as a scholarly output metric, via the Benchmarking module, allowing you to analyze and compare Researchers’ and Institutions’ research performance. Fig 4. Limit the scholarly output to Books and Book Chapters when analyzing a particular entity.